The 32’ x 12’ landmark 4K HDR LED display now provides travelers with critical information in the highest traffic central security terminal area. Mississauga, ON – April 10, 2018 – Travelers passing through Edmonton International Airport (EIA) can now enjoy Canada’s largest 4K HDR LED display within an airport, thanks to a new state-of-the-art installation by Samsung Canada and PATTISON Outdoor Advertising. Every day, 9,000 travelers pass through the Canadian Air Transport Security Authority (CATSA) central security area at EIA, spending a significant amount of dwell time there. To help reduce stress levels and elevate the travel experience overall, key information ranging from security waiting periods to gate time and details will be shown on the new 4K HDR LED display. Given that close to 40 per cent of global airport revenues are estimated to come from non-aeronautical sources, the stunning landmark LED screen is also used to advertise onsite EIA retail, food and beverage options, parking and more. The board will also be able to provide emergency updates in special circumstances as well as entertainment and live broadcast coverage. 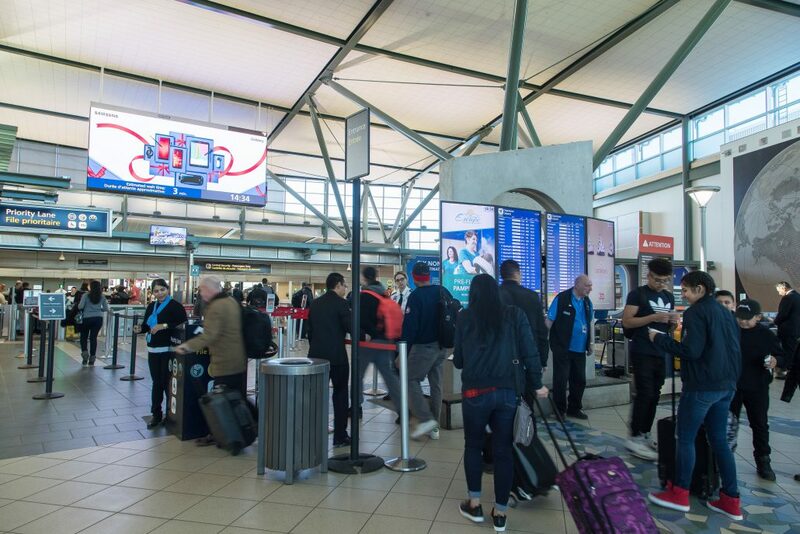 “As a leader in digital technology, we are pleased to partner with the EIA and PATTISON teams to create the largest 4K HDR LED airport display in Canada – an innovative and stunning solution that has the ability to help elevate the travel experience for passengers,” said Mary Peterson, Vice President, IT & Enterprise Solutions, Samsung Canada. Samsung has the ability to build seamless video walls that can adapt to any dimension, shape or curve. The stadium-screen sized display at EIA is 32’ x 12’ in size, providing eye-catching, bright and detailed image quality from wide viewing angles thanks to its fine 2.5mm pixel pitch. The new Samsung IF series boasts innovative HDR technology, creating a true-to-life viewing experience with high quality content. With limited wall space available for mounting within EIA’s central security area, the dynamic, dual-sided 4K HDR LED display was installed from the ceiling for maximum visibility and impact. PATTISON Outdoor, Canada’s largest Out-of-Home advertising provider and leader in airport advertising, manages the advertising operations for EIA. Providing EIA and its clients with high-quality products in highly sought-after locations, PATTISON prides itself on offering clients total advertising solutions that include everything from campaign conception, to design, through to completion. With PATTISON, advertisers benefit from a range of services to optimize their campaign. PATTISON’s full range of premium product formats in high-dwell areas at the EIA give advertisers an exceptional opportunity to engage a desirable consumer group made up of a higher-than-average income demographic. Samsung Electronics Canada inspires Canadians to reach their full potential through a transformative ecosystem of products and services that deliver innovation and distinct design to every aspect of their connected lives. The company is redefining the worlds of TVs, smartphones, virtual reality and wearable devices, tablets and digital appliances. In 2017, Samsung was ranked No. 6 in Interbrand’s “Best Global Brands” list. Dedicated to helping make a difference in the lives of Canadians, Samsung’s award-winning Hope for Children corporate giving initiatives supports public education, sustainability and health-related issues in communities across the country. To discover more, please visit www.samsung.com. Follow Samsung Canada at facebook.com/SamsungCanada, or Instagram @samsungcanada or on Twitter @SamsungCanada. Edmonton International Airport is a self-funded, not-for-profit corporation whose mandate is to drive economic prosperity for the Edmonton Region. EIA is Canada’s fifth-busiest airport by passenger traffic and the largest major Canadian airport by land area. EIA offers non-stop connections to 60 destinations across Canada, the US, Mexico, the Caribbean and Europe. EIA is a major economic driver, with an economic output of over $2.2 billion, supporting over 12,600 jobs. For more information, please visit: flyeia.com, follow @flyeia on Twitter, Instagram, LinkedIn or Facebook. PATTISON Outdoor Advertising, a division of The Jim Pattison Group, is Canada’s largest Out-of-Home advertising company. With its roots reaching back to 1908, PATTISON has been providing innovative solutions for Out-of-Home advertising opportunities with products ranging from classic billboards to transit, digital, airports, place-based, residential, office, and street furniture. PATTISON also offers Canada’s largest portfolio of Digital Out-of-Home (DOOH) advertising properties through PATTISON Onestop, a world-leader in the design, operation, and advancement of digital advertising networks for the office, transportation, and residential environments, and with its experiential/interactive development arm at Fourth Wall. PATTISON is headquartered in Toronto, Ontario and includes over 25 sales offices across the country providing advertisers unmatched reach and coverage with products available in over 200 markets coast to coast. Based on passenger statistics from Edmonton International Airport from February 2017-February 2018. According to the 2014 Airports Council International (ACI) Airport Economics Report: http://www.aci-na.org/sites/default/files/aci_airport_economics_report_aci_na.pdf.